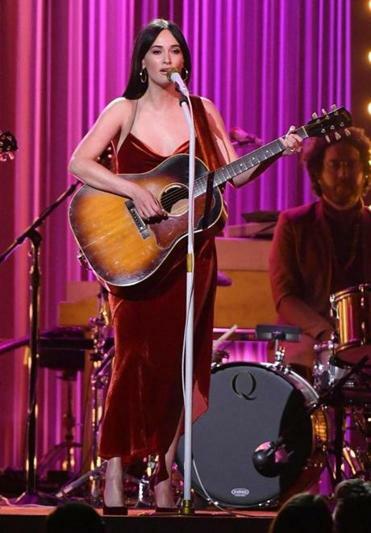 Kacey Musgraves performed during the 52nd annual CMA Awards in Nashville in November. It’s not hard to hear why “Golden Hour” turned Kacey Musgraves into the crossover country star of 2018. As the boys of pop-country gravitate toward booming heartland rock and hip-hop, while alt-country types stubbornly stick to the genre’s old-school roots, Musgraves’s gentle album of love-drunk daydreams simply floats above the competition — scratching an itch many twang skeptics didn’t know they had. Her triumphant performance at a sold-out Wang Theatre Saturday night was both a well-earned victory lap and a chance for Musgraves to prove that she’s more than earned her hype. From the first lines of the first song, “Slow Burn,” fans were loudly singing along and screaming their approval. Fittingly for someone whose next marijuana reference is never more than a few songs away, Musgraves kept a relaxed demeanor in the face of all this adulation. No need to over-emote or dance up a storm to hold our attention; her beautiful songs could stand on their own. By the end of the night, Musgraves and her six-piece band had played every song on “Golden Hour,” and it was a testament to the new record’s consistency that all 13 of those tracks were welcome additions to the setlist. With her band masterfully bringing the album’s warm glow to life, even the deep cuts shone bright, while fan favorites like “Butterflies” felt like modern classics. That only left room for a handful of songs from her first two albums, but between the tragic fatalism of “Merry Go Round,” the joyously defiant tolerance of “Follow Your Arrow,” and the goofy yet heartfelt “Family Is Family,” they summarized the origin story of the self-declared “Spacy Kacey” quite well. Some of the evening’s best moments came when Musgraves and her band (whom she introduced as “The Crispy Boys”) changed the songs up a bit. “Golden Hour” got a cool new finger-snap intro, “Die Fun” got a moody rock outro, and “Oh What a World” got a lovely stripped-down reworking as part of an acoustic set complete with cello and stand-up bass. The most surprising (and fun) curveball was a duet with opener Natalie Prass on Gloria Gaynor’s “I Will Survive,” with Musgraves and Prass clearly having a blast tapping into their inner disco divas. “Get your roller skates on!” Musgraves declared as the band kicked into the dance groove of “High Horse,” and a slew of giant glowing balls were thrown into the audience. It was a gleefully ridiculous note to end on, seemingly more fit for an EDM DJ than a country singer; such is her singular, boundary-defying appeal. After a show like that, even a Boston snowstorm couldn’t wipe the smiles off delighted concertgoers’ faces. Prass opened the evening by leading her absurdly skilled backing band on a trip through retro styles that included snappy pop-funk, silky-smooth yacht-rock, and utterly heartbreaking soul balladry. With Natalie Prass. At the Boch Center Wang Theatre, Jan. 19. .com. Follow him on Twitter @terence_cawley.